HGA converted this former Ford Model T Assembly Plant into a modern office building in a growing part of downtown Minneapolis. The historic building features a restored red-brick façade with rebuilt original windows and architecturally compatible replacement windows, new public entrance pavilion, and renovated lobby with 20-foot-high ceilings. For HGA’s own office on floors 1 through 4, the design team converted the original 1st-floor showroom into a gallery with conference rooms, commons area, espresso bar, and lunch lounge. 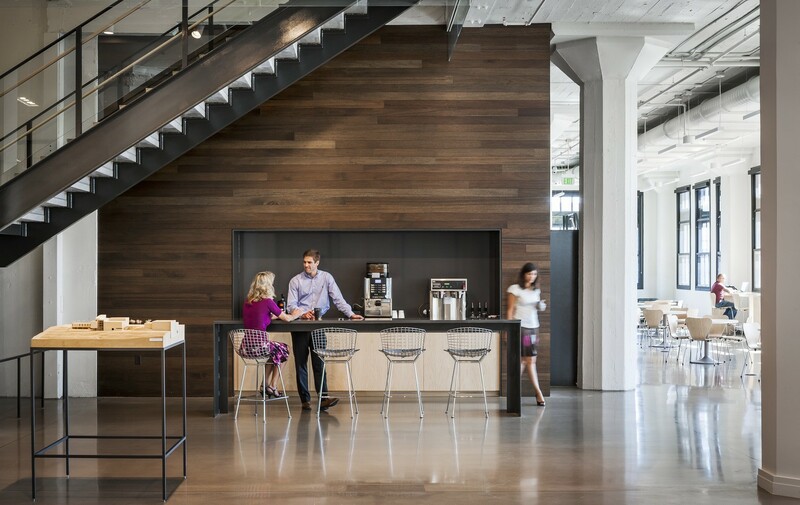 A former industrial elevator shaft now features a central stairway that connects the office floors, where open work stations and “co-lab” teaming stations encourage cross-disciplinary collaboration. Expansive industrial windows infuse the floors with daylight. LEED® CSv2 Silver (Ford Center); LEED® CI Platinum (HGA Office Interiors).